Caption slip reads: "Photographer: Wyman. Date: 1959-07-31. Reporter: Reay. Assignment: Councilwoman's daughter. 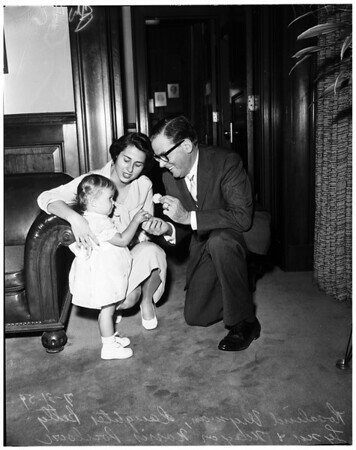 19-20-29-30: Councilwoman Rosalind Wyman & daughter, Betty Lynn, 15 mos. trying out maw's chair & phone. 46: Councilwoman Rosalind Wyman daughter Betty Lynn, meet Mayor Norris Poulson".